Save Money By Insulating Your Crawl Space! Fiberglass insulation in a crawl space tends to absorb moisture and humidity from outdoor air, grow mold and eventually will fall from the joist cavity. Even when it’s installed properly, wet fiberglass is a poor insulator. Does your home have a crawlspace? If it isn’t insulated, then it should be! For such a small area, a crawl space offers huge energy savings when properly insulated. 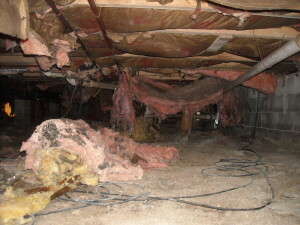 So if you’re going to insulate your home, DO NOT overlook the crawl space. Crawl spaces are small, confined spaces installed directly into the dirt under your home. Since they are in the soil, they tend to soak up the natural cold of the earth around your home and outdoor air and transfer it into the air in your crawl space. If you have utilities in your crawl space such as your heat ducts, furnace, or hot water pipes, your energy bills will go up. This cold air entering through the vents will harm your utilities, forcing them to work harder just to maintain a comfortable environment. At Indiana Crawlspace Repair, we can upgrade your crawl space’s energy efficiency with a broad selection of products that are durable, long-lasting, and made especially for the crawl space environment. Contact us today for your free, no obligation crawl space insulation quote! 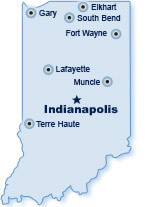 We serve the Greater Indianapolis Area and many surrounding areas, including Avon, Carmel, Fishers, Noblesville, Bloomington, Columbus, Greenfield, Plainfield, Mooresville, Martinsville, Greenwood, Franklin, Columbus and nearby. Why should you insulate your crawl space? Why is crawl space insulation so important? Well, If your crawl space isn’t well insulated, you are paying higher energy bills every month to heat against outdoor air that is entering your crawlspace. You wouldn’t open your windows and try to heat your home, would you? If your crawl space is encapsulated, it’s generally recommended to insulate the band board or walls. Whether your crawl space is ventilated or unventilated, encapsulation and air sealing is extremely important. Air sealing and insulation are services that often go together because air leaks can compromise the performance of insulation! Improves the overall performance and extends the life of your HVAC systems by reducing the latent load on the unit.